Trebah is described as "exemplary"
Some of the most beautiful gardens in Cornwall have won international recognition by the Council of Europe. They are to be included in a new cultural route linking estates across Europe. It is expected the new status will attract extra overseas visitors. 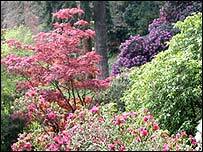 The Council of Europe describes two gardens, Trebah, which is on the Helford River and Heligan, near Mevagissey, as "exemplary". Trebah's Giles Clotworthy hopes the county will benefit. He said: "It can only be an indication of the fact that Trebah and Heligan and other Cornish gardens are up there with the very best in terms of quality and standards of maintenance. "I think we've always rather known that but it's nice to have it confirmed." The Cultural Routes programme was launched by the Council of Europe in 1987.